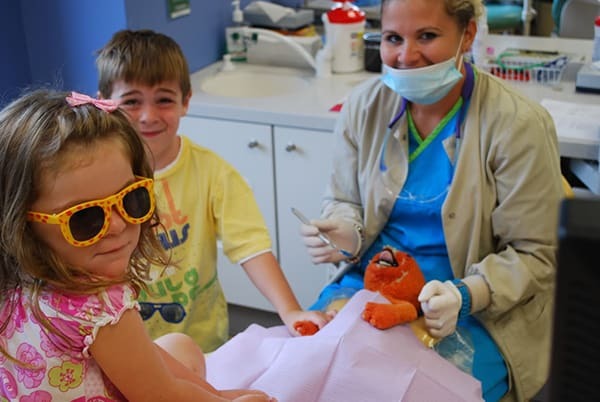 We view your child’s first visit as our first opportunity to show your child how fun and exciting dentistry can be! Our goal is to make your child as comfortable as possible while teaching how to take care of his/her teeth. Our office is designed with children in mind and our staff treats your child as if they were one of their own. Getting an early start in regular dental care is an important step on the road to teaching your child healthy lifetime dental habits. Get started early with dental visits as the American Academy of Pediatric Dentistry, the American Academy of Pediatrics and the American Dental Association all recommend that a child see the dentist for the first time around his/her 1st birthday. This allows us to develop a custom preventive program especially for your infant or toddler. Dental problems can begin early. Once your child’s diet includes anything other than breast milk then the erupted teeth are susceptible to decay. Research studies indicate that dental cavities are the most common chronic childhood disease in America and affect 50% of 1st graders! The earlier the dental visit, the better our chances of developing a preventive program that can keep your child cavity free! Facts about finger, thumb and pacifier habits. Our infant and toddler exams take place in our infant rooms where we are able to bypass the potentially intimidating exam in a dental chair in favor of a more comforting “knee-to-knee” exam. We have the parent and child participate in a knee-to-knee exam where the child sits in his parent’s lap and leans back into the lap of the dentist for examination. Please view our video below for a demonstration of a knee-to-knee exam (coming soon). We will also demonstrate proper brushing technique for your child so that you can keep his/her teeth clean and sparkly at home. Of course, no visit is complete without a trip to the prize bin or prize machine! Many parents are concerned that their infant or toddler may cry at the first visit. While we make every effort possible to ensure that your infant or toddler’s visit is as happy as possible, some children do react to a trip to the dentist with fear or crying. This is normal behavior and our doctors and staff will comfort your child to make the appointment as happy as possible. We always make sure to praise your child for the things that they have done well and make the visit end on a happy note with a prize and a balloon!